In shamanic and metaphysical teachings, the horse is symbolic of freedom, power and movement, and the tiger is a metaphor for one’s life force. The appearance of a tiger is thought to be symbolic of an awakening of passion or life energy, or a sign to examine how one is using one’s life energy (especially if it has been dampened or low). Similarly, the horse as a totem is said to represent a movement from constriction into expansion, self-expression, and self-assertion to move forward or move on (Andrews, 1993). (Waking the Tiger, 1997, p. 66). With equus being the Latin word for “horse” (representing all members of the equine family), and soma being the Greek word for “body”, the name EQUUSOMA™ emerged as the natural linguistic representation of this symbolism. The synchronistic discovery of Kim McElroy’s image and poem linking horse and tiger energies, in light of the symbolism they hold in Somatic Experiencing®, led to the natural development of the EQUUSOMA™ logo combining these powerful archetypes in the context of healing from trauma. 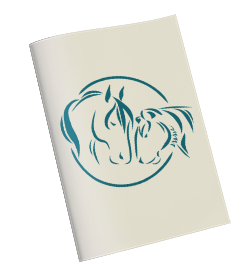 The original logo for client programs was EquuSpirit: Healing with Horses, inspired by indigenous perspectives that nature is a source of healing, and that horses in particular carry their own form of medicine. The quote by Dr. Levine about the archetype of the winged horse is reflected in the feathers in the horse’s mane. The combination of the two metaphors represents the dual power to move forward with energy and aliveness, and lift us above and beyond the barriers, both inner and external, that limit us. I am passionate about the mammalian connection between horse and human and how we can co-regulate and partner with each other in the healthiest of ways. To relate on all levels of partnership — physical, emotional, mental and spiritual. Then to notice how these practices carry into our human relationships and roles. Not to mention how fun it is to “speak horse” — to understand a horse’s view and to recognize their ancient wisdom in the natural world. To feel into how this level of relationship is often missing in our modern world. To notice how trusting horses are of the human predator nature while being a natural prey animal.